Just ask any pre-school child who their favourite person in the world is and virtually in all cases the answer will be “MUM”, once passed their teenage years the answer is usually the same. Mums matter big time and no more so than with sheep, we need our ewes to be maternal, more lambs will survive the first few important hours after birth, lambs grow closer to their full potential if mum is looking after them and milking, if mum can count she does not lose or forget her lambs – It’s the key to cheaper lamb production – she does all the work because she just loves her children. Not all sheep do! A lot of terminal breed ewes are certainly not the best mums in the world. I have been sheep farming for nearly 40 years; the first 20 years running a cross bred flock .I changed to a New Zealand Romney flock in 2000 and have never looked back. I guess this makes me a slow learner! 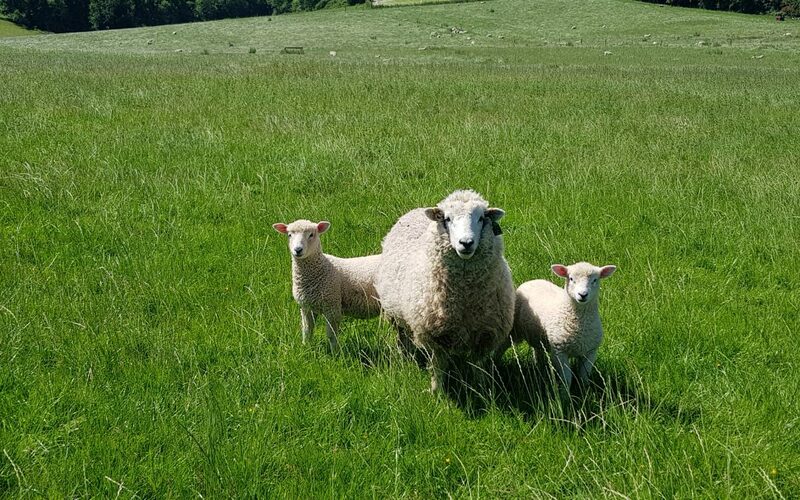 When we have New Zealand sheep farmers visiting us, they are all surprised at how focused the average UK sheep farmer is on the terminal sires he is going to put over his ewes, but pays little thought to the maternal instincts of his ewe flock and how they can be improved. Yet she is going to have a huge effect on cost of production i.e. extra management at lambing time, lamb survival, lamb growth, creep feed etc. As sheep farmers we don’t want tups that will throw lambs with big heads and wide shoulders -they don’t pass easily through the birth canal and if stressed at birth they are dozy for hours afterwards and therefore not getting that vital colostrum as soon as possible. Maternal ewes with large pelvic areas are the trick to lamb survival which is a key area of profitability – dead lambs don’t make money! It’s not all about lambing percentages – survival matters! The kiwi farmers understand the importance of maternal traits and are constantly trying to improve them within their flock. ”It’s like depositing money in the bank” if she is trouble why breed from her get- those genetics out of the flock! It all comes back to having a self-replacing flock where you are in control of the genetics, the cost of replacements, and the bio security of the flock. Virtually all dairy farmers breed their own replacements from their best cows- Why don’t you? Do yourself a favour and try a Wairere Ram! New Zealand’s national flock is predominately self-replacing and has been for decades (Ever.) Wairere is the number one ram seller in N.Z which has hugely demanding farmers as its clients. Wairere could possibly be the largest single ram seller in the world as they have joint venture flocks in South America and Australia and well as in the UK. We are not just New Zealand Romneys we are Wairere New Zealand Romneys – there is a big difference. This spring has not been without its challenges (understatement) and it has been very encouraging to have had a number of clients ring up and say how pleased and relieved they have been to be running Wairere bred stock. The same comments have also been aired as the drought continues to grip. Sheep need to be bred for resilience and constitution and at Wairere they have been doing this for decades, they are not a fancy named x bred, but a proper self-replacing animal that has been honed over 60 years. You can’t sell 3500 plus rams a year in New Zealand without ticking all the boxes. The icing on the cake is that Wairere UK performance record them on a second quality, forage only diet – NO Concentrates. The Wairere ewe is a deep gutted animal that is very happy to perform on second quality grass, or if you are lucky enough to have a farm that actually grows grass stock her a lot heavier. Get in touch with us as we would love to hear from you. See what Wairere NZ is up to across the pond!